what you’re supposed to do now? Or, maybe you found out some time ago, but the emotions are still as raw as if it were yesterday and you feel stuck? Do you feel unable to move forward and worried you’ll make all the wrong decisions? First, I am so sorry you have found yourself in this very difficult and painful situation. You didn’t ask for this and were likely blindsided by the news that your wife had an affair. because she is acting so different like another person entirely. 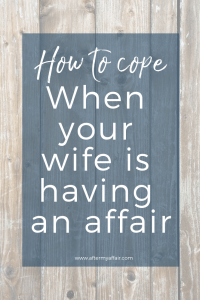 “Affair fog” will do this to the unfaithful spouse. They can’t see clearly and begin acting like someone completely different. betrayed husbands and unfaithful wives can be harder to find. And sometimes the advice is not very helpful or puts the blame on you as the betrayed. First, this is NOT all your fault. She made her choices and you cannot blame yourself for the actions that someone else chose to make. 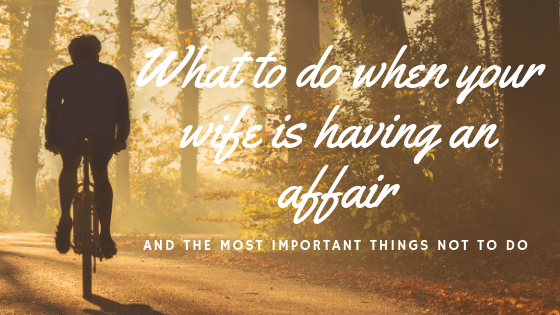 Please know that although this post is written from the perspective of ‘I was the unfaithful wife’, I also understand a little bit of what your wife may be feeling and going through. So I will share from my perspective of what my husband said he did that helped him and what made things worse. Briefly, let me say, I was completely shocked that I was capable of even having an affair. I let my guard down and was vulnerable to it. No excuses, my behavior was awful. I also was so deeply entrenched in ‘Affair Fog’ that I didn’t think I could live without the guy. (all lies in my head I believed). So I know a bit about that firsthand. You can read more of my story here and our marriage story here if you have a few extra minutes. Our marriage survived this but it wasn’t immediate, or easy, in the beginning. I realize this may not always happen and a lot depends on both spouses really wanting to work on it. I just wanted to share that with you first. The 5 Most important steps to take after finding out about your wife’s infidelity. Self care is very important right now and can easily be the first thing you let go. DON’T. You won’t be any good for your kids, your job or yourself if you don’t prioritize and have self-care. What do I mean by self-care? 1. Eat regular healthy meals as much as possible. You might not want to eat, but eat anyway. My husband lost 20 lbs in the first MONTH after I confessed to my affair. People at work thought he had cancer. He just didn’t feel like eating. OR, you may want to emotionally overeat. Limit that. you probably will need more now than usual. Don’t stay up until dawn, it’ll only wear your resistance and emotions down further. 3. Give yourself space and time to grieve. This discovery has surely sent you into shock and can be as traumatic as a death in some ways. Depending on what emotion you usually default to naturally will be the one that surfaces first, but it’s totally normal to have a wide range of emotions, often in the same day or hour! Be kind to yourself and let yourself cry when you need to. Yes, grown men cry. It’s good to do sometimes, bud. 4. Do see a good counselor, and consider prayer. Find a good counselor who will help you sort through your emotions and help give you some techniques to work through them. I’d caution you to choose one who does not have their own agenda (because counselors are human and their own opinions and own history may influence their advice). Be sure they’re not going to try to sway you to divorce OR stay. That decision is yours alone. They are just there to help you sort through the pain and have an objective person to bounce stuff off. I’d also like to add please pray. Even if you don’t believe in this God stuff right now. What do you have to lose? Honestly, this should be #1, but because I don’t know where you’re at spiritually I’m going to sprinkle it in here. I believe there is a God who truly loves you and sees what you are going through. He is grieved by what is happening with your marriage and your wife’s choices too. I hope you will use this time to just cry out to Jesus and let him know your hurts and confusion. If you want to know more about what faith in Jesus even means, click here. 5. Be careful who you talk about the affair to. I’m definitely not say don’t tell anyone, just choose that trusted friend or family member carefully. This one is tricky because many of your friends and family are going to want to tell you to divorce her and may egg you own in your anger toward her. Understandably, their own opinions and defense of you being hurt will cloud their judgment. They may tell you things that aren’t always in the long-term best interest of you and your wife reconciling in the future. So limit who you tell and really think about if they are a safe person who will be supportive of you no matter what you eventually decide to do. Some people were telling my husband to “change the locks on me” “tell her parents what she’s doing!” stuff like that. Well, luckily he didn’t listen to them or that would have drove me further away in anger. They didn’t know me really. They didn’t know shame would turn me away further. So be careful who you tell AND what advice you listen to. eat healthy and try to eat even when you don’t want to. It’s okay to cry man. Really it is. Let it out. See a counselor to help sort through feelings, and pray to God for His help right now. Be careful who you tell. Choose your confidants carefully so not to complicate life later. I’d love to hear from you. Please feel free to contact me about any comments from this post, how you might apply what you read here, or suggestions on posts you’d like to read about in the future. I’ll get back to you as soon as I can. Contact me here.